The W. Flaccus and Ruth B. Stifel Center at Adkins Arboretum. Lake|Flato Architects. Click on the image to view a larger version. The Arboretum's existing Visitor's Center, a 4,000-square-foot building, was built in 1985 by the Maryland Department of Natural Resources. 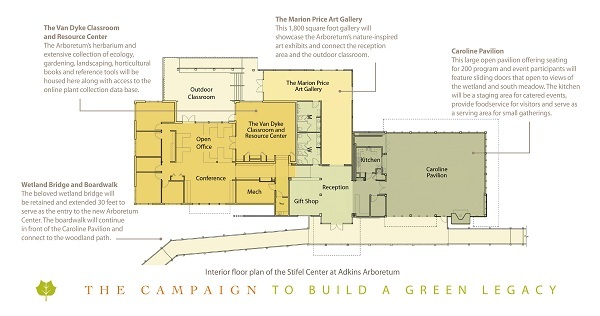 The Capital Campaign Project includes construction of a 6,500-square-foot addition to the current building for a total of 10,500 square feet, and a reconfiguration of the Arboretum's entranceway and parking areas for easier access and immediate immersion of visitors into the Arboretum experience and its conservation mission. 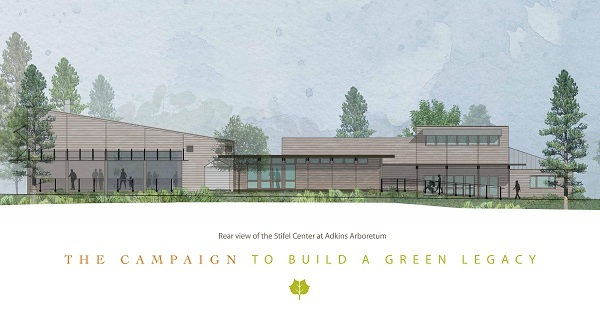 As a gateway to the native landscape, the new W. Flaccus and Ruth B. Stifel Center at Adkins Arboretum is designed to frame the Arboretum's natural features: the Wetland, the tree-lined Blockston Branch, and the South Meadow. 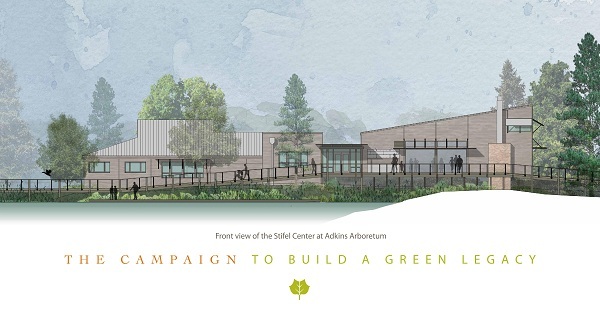 The Arboretum Center is where visitors will begin their tour, participate in educational programs, view exhibits, gather to celebrate community and seasonal events, shop, rest, and enjoy refreshments. Visitors will depart with an appreciation of the region's indigenous flora, a renewed sense of the imperative to protect our natural environment, and the tools to create a sustainable landscape for the future. The Caroline Pavilion will provide seating for 150 and will accommodate children and adult programs, including workshops, lectures, and community events. The walls will be large sliding doors that open the room to views of the Wetland and the South Meadow. The art gallery, named for Marion Price, the Arboretum's first art curator, will exhibit nature-related art from local and regional artists. This classroom space will also house the Arboretum's herbarium and the Arboretum’s comprehensive collection of horticulture, gardening and landscape design books and materials. The existing Visitor's Center will be renovated for additional staff and volunteer offices, meeting rooms and a new “open-air” outdoor classroom for school, scout, and summer camp programs for children. Click on the image to view a larger version of the rear elevation.